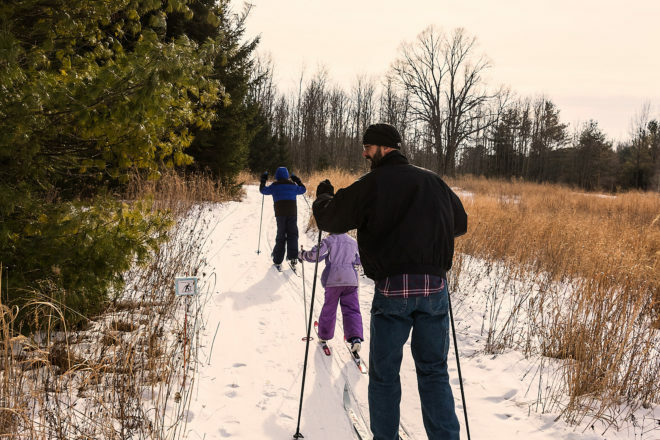 Get the family out for some fresh air and exercise during Ski for Free at the Crossroads at Big Creek in Sturgeon Bay. Photo by Len Villano. On Feb. 8, 2 pm, a screening of the documentary All Washed Up in the Collins Learning Center of Crossroads at Big Creek will examine how a couple of small, invasive mussels exacerbated our cladophora problem. Ski for Free will be offered Feb. 9 and 10, 9:30 am – 3:30 pm. The program lends, free of charge, an array of ski and snowshoe equipment, so when trail conditions permit, go to the Crossroads Maintenance Building to have volunteers fit you with equipment. Door County Reads (DCR) 2019 arrives at Crossroads on Feb. 11 with a daylong writing workshop, held in collaboration with Write On, Door County. The event features three sessions: a fiction workshop with Peter Geye, a DCR 2019 author, at 9 am; a poetry workshop with Door County Poet Laureate Sharon Auberle at 11 am; and a nonfiction workshop with Amber Stoner at 1:30 pm. These sessions have indoor and outdoor components, so dress for the weather. More information and registration are available at writeondoorcounty.org. The workshops are free, but registration is required. Join the Door County Master Gardeners Association on Feb. 12, 7-8:30 pm, in the lecture hall of the Collins Learning Center for “The Little Shrub with Big Flowers.” Nate Bremer of Solaris Farms will explain that tree peonies are among the finest flowering plants available to gardeners today and can easily be grown in most of Wisconsin. The Collins Learning Center, at 2041 Michigan Street in Sturgeon Bay, is open 2-4 pm daily and during scheduled events.